I arrived in Phong Nha at 5.30pm so originally I followed the crowd to the party hostel but after waiting a while for a receptionist, I decided to find a hostel where I could check in straight away. Opposite was a place where the guy gave me a room to myself to have some sleep before having breakfast. I met three Americans at breakfast, where we spent the day together. I had so much fun. 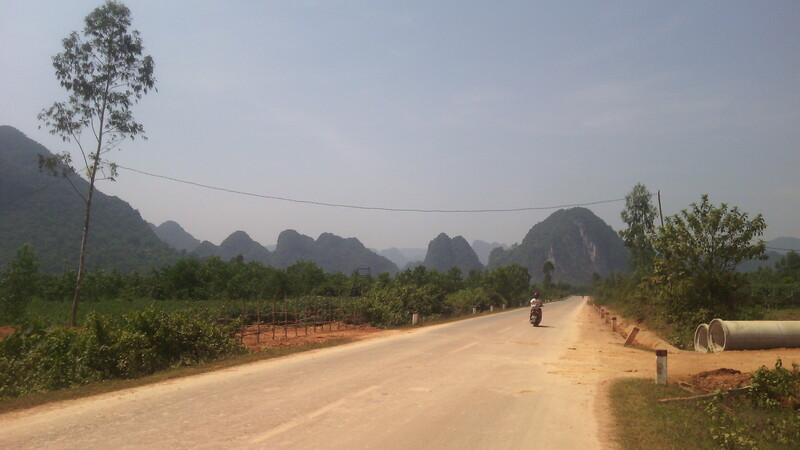 We hired a motorbike, drive through the country to the Dark Cave. However, on the way my bike broke down but some Vietnamese guy stopped to help, consequently ringing the travel agency, I rented the bike from. Within half an hour, they swapped for a new bike and we were on our way again. When we arrived at the cave, we grabbed lunch before changed to the gear: harness and life jacket. First, we zip lined across the lake, which was just exhilarating then swam and jumped off a tree. Struggling with the life jacket to swim, we eventually got to the entrance of the cave. Climbing over rocks and through narrow passages with our helmets and head torch, we managed to find the thick mud baths the dark cave. It felt so weird and it was strange that I could just sit on the mud without sinking. As we were meandering through a few of us started a mud fight, which was so much fun. Once we exited the cave, we kayaked in pairs along the lake to a lower zip line, which forced me to drop into the lake in my back and a high obstacle course, which I failed at. We were planning to go somewhere else but time took over so we headed back through narrow, potholed lanes to the hostel. In the evening, we had dinner at a restaurant, where I had aubergine stew and then played pool while enjoying some beers. The bar had an open mic night with some talented singer and guitar players.